We offer high quality filter housings from Watts and Pentek, and Viqua's easy-to-service Advanced Water Products™ housings. Size 1 (2.5" x 9.75"), standard size for most undersink and reverse osmosis units, Size 2 (2.5" x 20") and Size 3 (4.5" x 10"), for moderate-flow whole house units, and Size 4 (4.5" x 20") for high-flow whole house filters. High flow filter housings from Viqua make cartridge changes easy with their unique lock-ring design—just unthread the ring and the sump slides off. 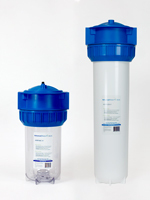 We offer these Easy-Off filter housings in Size 3 (4.5" x 10"), for moderate-flow whole house units, and Size 4 (4.5" x 20") for high-flow whole house filters. 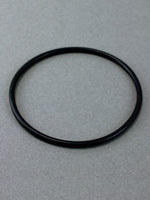 O-rings ensure that housings don't leak, but they can flatten or deteriorate with time. They should be changed regularly (typically with each cartridge change) to ensure leak-free use. 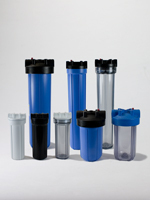 We offer o-rings for countertop filters, undersink filters, reverse osmosis units and more. Filter wrenches can help to loosen tightly screwed in housings. 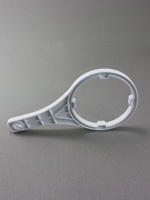 We offer a wide range of wrench sizes for many of the housings featured in our products. Along with standard, inexpensive plastic filter wrenches, we offer long-lasting steel Superb Wrenches.